The NYC Health Code requires supervisors of food service establishments and non-retail food service establishments be certified in food protection. This means a person-in-charge, an owner, or manager of a food establishment – (i.e., restaurants, bars, cafes, bakeries, delis, mobile vending, food trucks, assisted-living, day care centers, and convenience stores) become certified by taking a approved food manager training course and successfully passing an accredited food manager certification exam. (a) Food protection certificate required. No person who is charged with the management or supervision of the operations of a food service establishment or non-retail food processing establishment shall engage or be employed in such capacity unless he or she obtains a certificate issued by the Department subsequent to successful completion of a course in food protection, and passage of an examination administered by the Department. No person required to have a license issued pursuant to §89.03(b) of this Code shall be issued such license unless he or she obtains such a certificate. A person holding such certificate shall be on the premises and shall supervise all food preparation activities during all hours of operation. 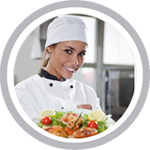 Our 16 hour HACCP training course is the first accredited nationwide HACCP course for retail food establishments. The HACCP for Retail Food Establishments course is accredited by the International HACCP Alliance and teaches the theories and practices of HACCP. Once learners have successfully completed the course, they will understand how HACCP is applied through Active Managerial Control (AMC) to establish a functional food safety management system. We offer online Food Safety Training in New York for: New York City – NYC, Buffalo, Rochester, Yonkers, Syracuse, Albany, New Rochelle, Cheektowaga, Mount Vernon, Schenectady, Utica, Brentwood, Tonawanda CDP, White Plains, Hempstead, Levittown, Manhattan, Bronx, Queens, Brooklyn, Staten Island, and many more!